If you need Hydraulics – visit High Seas Hydraulics. All in a day’s work for High Seas Yacht Service. Click to watch the video of a day at High Seas Yacht Service. 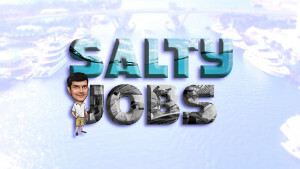 Click to watch Marine Industries Association of South Florida video featuring Salty Jobs at High Seas Services. Our work is guaranteed and we deliver on time. Poor engine and strut alignment leads to unwanted vibrations, loss of power, reduced fuel economy and accelerated wear on bearings and transmissions. To schedule an inspection while you are in the Fort Lauderdale area or compare notes on a technical question, call or email Chris. 954-975-8220 Chris@HighSeasYachtService.com. 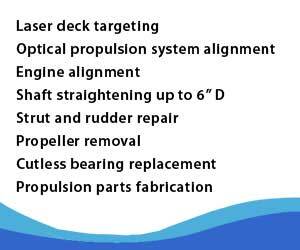 Watch this video of a High Seas technician performing a scope alignment on a 49 foot EastBay. How Much Does My Boat Weigh? Fort Lauderdale International Boat Show is Right Around the Corner. Eliminating Engine Vibrations – Is a Strut Alignment the Answer? American Boat Builders and Repairers Association, Inc.